The property has a beautiful arrival, with a circular drive and manicured lawns. 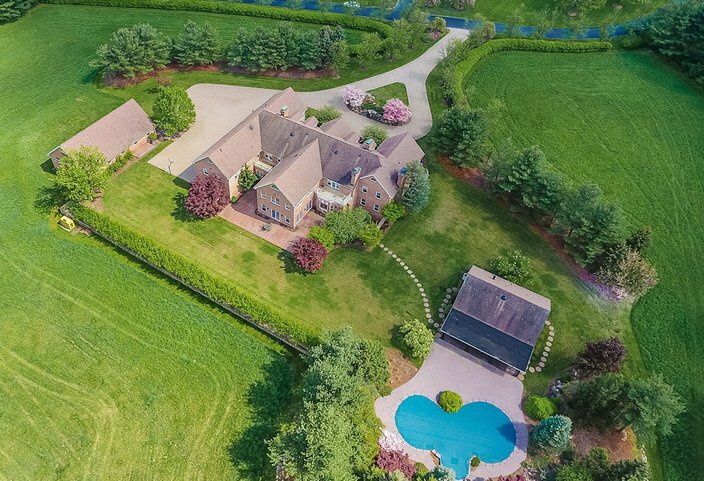 A beautiful mansion set on 10 acres in New Jersey is going to auction – and there is no reserve price. The initial ask on the home was $8 million but now the property will be auctioned without a minimum price by Platinum Luxury Auctions of Miami. The private tri-level home with detached pool house and in-ground pool is situated in a quiet cul-de-sac in the town of New Vernon, about 65 miles from Philadelphia and 40 miles from New York City. The 10-acre property currently allows for a farmland assessment, which reduces property taxes. The property's location would make an ideal location for a wealthy Philadelphia executive, the auction company noted. Beginning Monday, the property will be open for previews between the hours of noon and 5 p.m. until the March 27 auction date. Information is available here, or by contacting a member of the Platinum's project management team at 800.674.3325.